Jewish settlers were evicted from a home near the Cave of the Patriarchs in Hebron without incident. 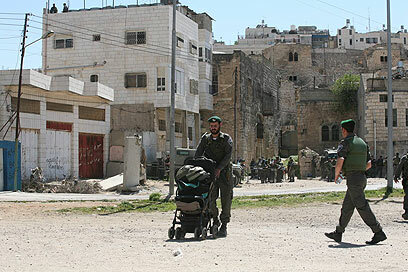 Israeli security forces on Wednesday evacuated the Jewish families from the home they had entered a week ago. The evacuation reportedly took only a few moments. The evacuation was carried out on the orders of Defense Minister Ehud Barak. “I will continue to act in order to maintain the rule of law and democracy while guaranteeing the authority of the State over its citizens,” Barak said in a statement following the evacuation. On Tuesday, Prime Minister Benjamin Netanyahu and top government ministers including Barak and Benny Begin had decided that the settlers would be removed from the home by April 26 if they could not prove that they had legally purchased and moved into the house. The Israeli officials’ meeting occurred hours after a mid-afternoon deadline for the settlers to leave the home passed with no consequences. The eviction order issued Monday afternoon by the Israeli military’s Civil Administration said the settlers’ presence in the home violates public order. The residents of the home also did not request nor receive a required purchase permit from the Civil Administration. That evening, Netanyahu asked Barak for a delay of the eviction until the settlers had an opportunity to prove in court their ownership of the house. Armed with documents that say they purchased the home from its Arab owner, the Jewish families entered the home in the middle of the night on March 28. Hebron Mayor Khaled Osaily told Army Radio on Tuesday that the sale papers are forged and that the person who sold the house to the Jewish settlers is not the owner. Prime Minister Benjamin Netanyahu and Defense Minister Ehud Barak are the focus of fierce criticism following the eviction of the Machpelah house in Hebron on Wednesday. Sources close to Netanyahu said in response: “The coalition is stable, the eviction was coordinated.” Netanyahu himself reportedly expressed his commitment to the continuation of the settlement in Judea and Samaria, specifically in Hebron. Ministers from the Right reproached Defense Minister Barak, who authorized the eviction. Habayit Hayehudi Chairman Minister Daniel Hershkowitz compared the move to “poking fingers in the eyes of the people. “This is not a battle between law-abiders and lawbreakers, but rather between those who cherish the settlement project and those who seek to destroy it,” Hershkowitz noted.